Photographs in a prosecution motion depicts evidence that could be used in activist and actress Rose McGowan's upcoming cocaine possession trial in Virginia. In less than two weeks, McGowan — one of the first women to accuse movie mogul Harvey Weinstein of sexually assaulting her — will go on trial in Loudoun County Circuit Court on a felony cocaine possession charge, which carries a statutory maximum of 10 years in prison. A recently-filed motion by prosecutors includes 15 photographs of evidence, which could be introduced at trial, scheduled to run Jan. 15 and 16. According to charging documents, a plane-cleaning crew found McGowan’s wallet next to her seat after she got off a flight at Dulles on Jan. 20, 2017. McGowan had flown from Los Angeles to take part in the Women’s March, the day after President Donald Trump took office. Airport police said the wallet contained two small bags of white powder, which tested positive for cocaine. 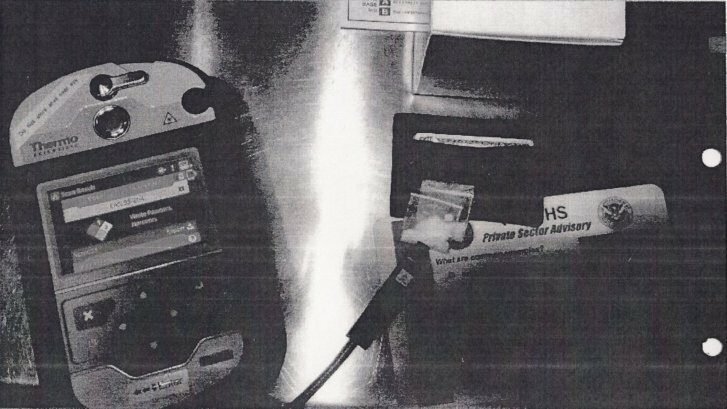 A photo of the contents of McGowan’s wallet includes $45 in cash, a California driver’s license, a medical marijuana ID card, a charge card, a bank card, a prescription card and a frequent flier card. Also included in the motion is a document from Virginia’s Department of Forensic Science, certifying that the off-white solid material in one sealed plastic bag containing two zip-close bags was cocaine. Prince William County Commonwealth’s Attorney Paul Ebert and Assistant Commonwealth’s Attorney Rebecca Thacher are acting as special prosecutors, after Loudoun County prosecutor Jim Plowman recused himself. Though Thacher told the judge at McGowan’s preliminary hearing that she is “being treated like every other citizen,” McGowan’s defense team will attempt to foster reasonable doubt at trial, claiming that McGowan is being treated more harshly because of her fame, and perhaps because of her voice in the #MeToo movement. And then, there’s the matter of what role — if any — Weinstein will play in McGowan’s defense. Weinstein has been accused of sexual improprieties by 80 women. He is charged in New York City with sexually assaulting two women. He has denied the allegations, saying all of his relationships have been consensual. Shortly after her arrest, in interviews and in court filings, McGowan and her attorneys suggested the cocaine in her wallet was planted, perhaps by someone working for Weinstein. McGowan’s attorneys have argued prosecutors have provided no evidence that placed McGowan and the cocaine in the same location at any point, and that several people had access to the wallet over 12 hours. In trial, prosecutors could call six witnesses who testified in McGowan’s May 2018 preliminary hearing. The witnesses include two members of the plane-cleaning crew, two airports authority firefighters who tested the white powder and determined it was cocaine, and an airport police corporal. Prosecutors are expected to call Detective J.C. Hughes, who has testified he phoned McGowan to inform her he had her wallet. During the call, McGowan asked it be left at baggage claim. Hughes, who was already aware that the powder in two plastic bags found in McGowan’s wallet allegedly tested positive for cocaine, said it could be picked up at the airport police station. Prosecutors said McGowan never contacted Hughes again, or picked up the wallet. “We charged the owner of the wallet. She admitted she lost her wallet. When she was told it was at the police station, she all of a sudden didn’t want to pick it up,” Thacher said. McGowan’s attorneys have never offered any independent proof that Weinstein, or anyone at his behest, planted the cocaine in her wallet. McGowan’s co-counsel, Jim Hundley, declined to discuss any evidence, or potential defense witnesses, when contacted by WTOP. Jose Baez — the lead attorney for Casey Anthony, who was acquitted of murder in July 2011 — is also representing McGowan. In May, Ebert was asked if McGowan could expect a fair trial in Loudoun County, given her high profile. “I don’t see why she wouldn’t get a fair trial,” Ebert told WTOP, adding nobody should be tried because of their public persona.